Helena Vasilyevna Manturova continued directly in the tradition of Mother Alexandra with the blessing of Fr. Seraphim. The Lord chose her for Himself. Having from childhood "an extremely happy character, love for secular, social life and an attraction for merry-making and entertainments," she was preparing to marry when she suddenly and for a reason unknown even to herself rejected her bridegroom. Soon the Lord led His chosen one out of the world, having shown her in a vision a monstrous snake that was ready to devour her and from which she was saved by the Mother of God. Then Helena Vasilyevna vowed to enter a monastery. She completely rejected secular life, read much in the works of the Holy Fathers, prayed and worked on herself. For three years St. Seraphim prepared her for entrance into his community, which took place in 1825. He prophetically foresaw her path in life and ordered her in everything to imitate Mother Alexandra. Mother Helena struggled in unceasing prayer, contemplation and complete silence. Once, when Helena was looking after her cell-mate Ustinia, who was sick with consumption, the latter was taken up into heaven and foretold what God had prepared for them both. Her life ended in a very wonderful manner: in obedience to St. Seraphim, she died instead of her brother Michael Vasilyevich Manturov. Before death she was taken up to the dwellings of paradise, where she contemplated God in the form of ineffable Fire, communed with the All-Holy Theotokos, who showed her the lot of the present, past and future Diveyevo sisters (pp. 420-423). She reposed on May 28, 1832, and during the funeral liturgy she thrice smiled in the coffin as if she were alive. Soon St. Seraphim revealed that Holy Mother Helena "has been counted worthy to sit not far from the Holy Trinity, as a virgin", and that she was "a maid of honour of the Heavenly Queen", and that together with St. Martha she had been counted worthy by God of incorrupt relics for the virtue of unquestioning obedience (p. 425). 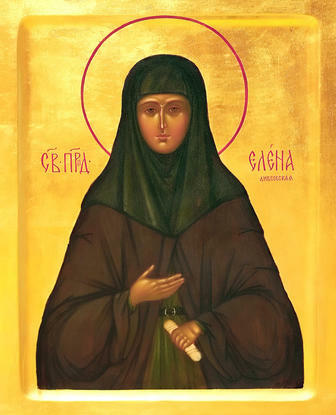 As Archimandrite Seraphim indicates in his "Chronicle", miracles and healings have often been worked at the grave of Helena Vasilyevna Manturova. They have been recorded in the community (p. 732).